Arabian Falcon International was the proud to sponsor of the 6th H.O.G.® Saudi Rally 2015 held in Jeddah. 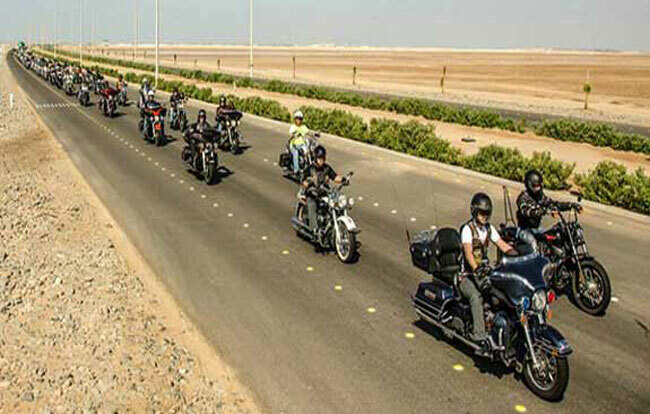 Harley-Davidson riders gathered in KAEC (King Abdullah Economic City) for the is a three day event. Geared toward Harley enthusiasts, all brands and riders were welcome to come together and celebrate Harley-Davidson and explore the Western Region of Saudi Arabia primarily “Bride Of The Red Sea” ( Arous Al Bahr Al Ahmar). The venue for this event was the Bay La Sun Hotel at King Abdallah’s Economic City KAEC and spanned 3 days: 26, 27 and 28 February. During H.O.G.® 6th Saudi Rally, riders took part in a variety of fun activities and challenging rides. The participants also enjoyed the festivities and rocked the night away. The participants savored Saudi and International cuisine and enjoyed the entertainment and music on the shores of the Red Sea. Mr. Mohannad Sharafauddin, Chairman of Arabian Falcon said “Arabian Falcon is proud to be associated with the Jeddah Chapter of H.O.G. – the biggest chapter in all MENA. We were glad to be a part of the event bringing 400 members along with family and friends, totaling 2,000 participants, who were able to enjoy this wonderful machine and an entertaining event”. Arabian Falcon gave away by draw fabulous gifts for the attendees including Free Stay in Dubai, Kuala Lumpur, and Marbella Spain.